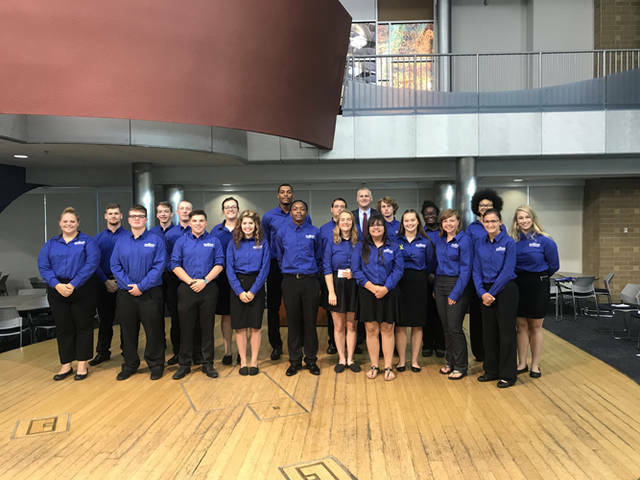 Miami Valley Career Technology Center student ambassadors and MVCTC Superintendent Dr. Nick Weldy, welcome the Class of 2020 to their first day of school. Pictured are (front row, l-r) Melissa Allen (animal care and management/Brookville), Carter Ward (graphic commercial art/Ansonia), Lucas Roush (architectural design/Wayne), Trinity Konwiczka (natural resource management/ Mississinawa Valley), Kwestion Ahmad (computer coding and web applications/Trotwood-Madison), Katie Trout (digital design/Carlisle), Makayla Allen (graphic commercial art/Twin Valley South), Lillian Pietrzak (medical office management/New Lebanon), Olivia Keihl (business ownership/Arcanum), Lainee Stiver (media and video production/Valley View), Adrian Hodapp (criminal justice/Eaton), (back row, l-r) Ryan Smith (aviation maintenance technician/ Wayne), Cameron McCormick (computer repair and technical support/Northridge), Brennan Halderman (retail agriculture services/Eaton), Carley Asher (veterinary science/Preble Shawnee), Justin Stephens (computer network engineering/Trotwood-Madison), Chace Trent (agriculture and livestock production/Tipp City), Dr. Nick Weldy (MVCTC superintendent), Miles Warren (graphic commercial photograph/National Trail), Kiara Reese (culinary art/Miamisburg) and Cherrel Captain (architectural design/Miamisburg). ENGLEWOOD – The Miami Valley Career Technology Center staff welcomed students for their 47th year of classes on Thursday. MVCTC Superintendent Dr. Nick Weldy, staff and MVCTC student ambassadors greeted more than 1,000 junior students from 27 partner school districts enrolled for the 2018-19 school year. Additionally, MVCTC is currently offering 23 satellite programs at 16 partner school district locations. On average, MVCTC serves more than 4,000 middle and high school students in the Miami Valley through the main campus, satellite programs and Youth Connections. For more than 45 years, MVCTC has provided career technical education for 27 partner school districts encompassing five counties in Southwest Ohio. MVCTC is dedicated to providing in-demand workforce training for youth, adults and organizations in the Miami Valley.